I know this is a bit late, but I'm posting it here just to have the major factors in my current running all in the same place. finally healthy, I trained like a demon: the five weeks before I began my one week taper for the race I logged over 1000 miles and many, many, many, hours of running, including one seven day stretch right before my taper that was over 36 hours and almost 240 miles of running, much of it over 10,000'. Consequently, I came into Leadville feeling like I was in the best shape of my life and that maybe I could really bust one out this year. The Thursday before the race it was absolutely pouring rain in Leadville, so I spent a restful night in the back of Jocelyn's car, which was good because even though it only sprinkled for five minutes or so Friday night, I ended up sleeping a max of about 30 minutes the night before the race--camped out in a tent in good ol' Ice Palace Park in Leadville. myself the possibility of a sub-16hr finish if the day ended up going well enough. Right from the beginning Joe Kulak (I think) and Scott Mason took off down the hill and opened up a 100 yard or so gap. I ran down the Boulevard in the dark with the rest of the front group just trying to go as easy as possible. Thankfully, it felt very easy, but I really needed to go to the bathroom. When we made the turn onto the road going past Sugar Loafin' campground I finally pulled off and watered a bush, which allowed the front group of ten or so guys to put a little gap on me. However, I caught all of them and took the lead for the first time as I ran up the powerline cut to the lake while everyone else walked. I then realized that my headlamp sucked as bad as I thought it did even though I was using Kyle Skaggs' (crew member and pacer), which had seemed to be super bright at the start. Oh well, this just forced me to take it perfectly nice and easy on the trail around the lake. to the aid station they all wasted a bunch of time doing something while I just ran right on through while Kyle and Jocelyn handed me a new bottle and some more gels. I dropped off the headlamp (there were no clouds to block the rising sun) and headed up to the Colorado Trail. I had eaten two gels (one right before Tabor, and one right before Mayqueen), but had basically drank no liquids in the first stretch because it was so cold and I had to pee so bad, but also because the Powerade in my bottle tasted horrible. The adrenaline from the aid station made me run up the road pretty quickly, and I felt great on the Colorado Trail and had to verbally remind myself to slow down and take it really really easy. This I did, but my progress was further slowed by dropping trou' about 15 minutes or so after Mayqueen. The short climb up to Hagerman Pass road felt very easy and once on the road I had to continue to remind myself to slow down and really relax. Just as I was coming around the last switchback on the climb up Sugarloaf Mountain, the sun broke over the horizon so I took off my shirt anticipating an uncomfortably warm day. The run down the Powerlines into Fish Hatchery was pretty uneventful--I just tried to take the downhill pretty quick but without trashing my quads. However, for some reason I started having some inexplicable negative thoughts. There wasn't a whole lot of "race day energy" flowing through me; I just wasn't very excited about running. Actually kind of bored, mostly. I was kind of disappointed in the lack of competition-but that had been expected-and I was sort of just uninspired by the course that I had run so much in training. Also, I think I started thinking ahead to the hours and hours of running that was still left and that's always daunting (and a very bad idea) in a 100 mile race. Whatever it was, it was kind of weird. However, right at the bottom of the powerlines there were some spectators cheering me on and that helped a lot to get me out of my mental funk (I felt completely fine physically). I felt great coming into the Fish Hatchery in 3:16:30 but was a little worried about my stomach and the fact that I wasn't drinking hardly anything. Every time I took a gel it was with reluctance-I just wasn't hungry at all for whatever reason. In training I typically take only 1 gel per hour, but here I was trying to get down 3 and at least 2 per hour. In the future, I might try taking more gels on training runs. I took only a bottle of water with me on the run over to Treeline (instead of Powerade), and really tried to drink it, but just didn't feel like it. I also consciously told myself to slow down and take it easy several times. I ran this section too fast last year and probably set myself up for such a crappy second half. It was nice to see Jim Kelleher out on the road on a bike. He asked me how I was feeling, and I replied, "Great!" because I was. At Treeline I switched back to a bottle of Powerrade from my crew and then just tried to run nice and easy. I remember thinking that the incline on the gravel Halfmoon Road seemed a lot easier than it was in training, but I was also worried that my legs were starting to feel tired too early. When I got to Halfmoon in 4:12 I was pleased with my 55/56 minute split from Fish Hatchery but (unnecessarily) concerned that my accumulative time to Halfmoon was too slow (about 3 minutes slower than last year). It was dumb to be thinking that, but those thoughts set me up to have a pretty crappy next section of the race over to Twin Lakes. When I hopped on the Colorado Trail I just tried to run easy to the top of the major climb out of the valley, and it was easy, but it seemed to be a bit longer than I remembered. However, on the next flat and rolling section over to the South Elbert trailhead and kept on trying to keep a solid pace all while worrying about how tired my legs felt at times. It was really starting to get me down mentally. When I got to the trailhead and started the downhill into Twin Lakes I was not in a good mood. For a while the downhill helped quite a bit to make me feel better, but because I was worried that my split was too slow I kept on trying to go just a little bit faster than what I was comfortable with (I never push downhills in training - this might be a mistake) and by time I got down into town I was grouchy as hell (but happy to see my split of 5:31:30, which meant I'd run 1:19-1:20 or so for that section - pretty much course record pace). I wasn't happy going through Twin Lakes. Instead of cheering me up all the hoopla there just pissed me off for some reason and when my crew asked me how I was feeling, I replied, "F---- tired." My left hamstring/hip was really tight and I already had that little bent-over hobble hitched step thing going on on little step-ups and hills. I just wasn't feeling it. I DID switch to just plain water at Twin Lakes, though. I knew I needed to be drinking a lot more and I sure as hell wasn't going to try drinking anymore Powerade (I'd barely touched my bottle since Treeline), and it was actually really sunny and pretty warm out. 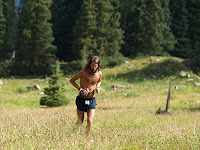 I left Twin Lakes determined to quit worrying about time and just run nice and easy so that my legs would feel better. So I did that. The meadow was really boggy and muddy this year. There was a new shin-deep pond we had to run through and then lots of shin-deep puddles leading up to the river. The river itself was flowing pretty good but only about knee to thigh deep-the part I'd been crossing in training was about 50 yards downstream and was neck-deep on me, so this was a nice surprise. On the bottom of the Hope Pass trail, I still wasn't feeling it. There wasn't much pep in my legs on the initial incline, so when the trail started going up in earnest I just settled into a very easy rhythm and decided I would walk if things seemed to get too hard. But, Hope Pass ended up saving me. On the flat section on the first switchback I could already feel my legs hamstrings and hips loosening up (which is weird, my hamstrings usually TIGHTEN on the uphills) and then just ran everything all the way up to the Hopeless aid station in 6:40. The trail was pretty wet and muddy, and parts of that trail are pretty steep, but I gained more and more confidence the higher I got on the mountain, especially when I saw that I'd split the climb 3 or 4 minutes faster than Matt's course record split. Plus, I'd finally drained my water bottle for once and spent almost a minute refilling and drinking water at the aid station. I figured that at this point, getting rehydrated was more important than relentless forward motion. I hiked most of the rest of the way to the top of the pass because I figured I'd picked up enough time on the bottom of the climb and because I was trying to get some gels down (note: no more Vanilla Clif Shots in races-I almost gagged). I did run the flatter sections, though. I hit the top of the pass in 6:54 and then felt terrible for the first part of the downhill. My legs just weren't into it. However, I decided to not force it and pretty soon I was running downhill with a lot more ease. But, god, I hate those steep downhills at the bottom of Hope Pass. I got to the trailhead parking lot in 7:19 and then started the run up to Winfield. This was the worst part of the race for me. It was hot and sunny out, the road was unvaryingly flat and even and the overall uphill also put a damper on things. I was going slow. The whole time I just kept telling myself that when I got to Winfield I could walk a few steps and things would be better. My legs didn't feel good and I was having a definite low point. When I got to Winfield (in 7:43) I somehow missed the chute into the aid station and ended up hopping the fence. When I swung my leg over the fence I was sure that something would cramp up, but nothing did-a good sign. Also, Kyle was rarin' to go when I got there so I didn't have a moment to even think about walking a few steps and we were on our way back down the road. Picking up Kyle to pace me helped so much. I'd been inside my head all morning and now I could talk to someone and this alone made my legs feel a lot better. I drained a whole bottle of water just on the road back to the trail, but Kyle had two more bottles, so we were fine. We got to the parking lot in 8:04:30 and started hiking up the pass. Hard. We killed the bottom half of the pass hiking the really steep stuff and running anything that was a little bit more moderate. I didn't see another runner until 32 minutes after I'd left Winfield, so I had a pretty big lead, but we just kept at it. On this climb I also started taking electrolyte caps for the first time ever because it was hot out and I wasn't drinking Powerade anymore. In the future, I'm definitely going to go with the water and salt cap combo instead of sports drink. When we got to the creeks about half-way up Kyle re-filled the bottles in the stream, we hiked the next steep incline, and then basically ran the rest of the way to the top. There's some nice moderate trail above tree-line there and this year I was strong enough to run most of it whereas last year I hiked everything. I felt very solid on this climb-definitely hurting, but like I had good energy to make myself hurt as opposed to being just completely blown out. We summited at 8:56 and went right down the other side. I must've been a little out of it, because I was tripping on rocks a little bit right at the top, but pretty soon I was cruising. Then, I tripped on something else and completely fell off the trail and rolled down the mountainside. I grabbed onto a little shrub that I pulled completely out of the ground trying to stop my fall, and then somehow was right back on my feet and flying down the mountain again. It was pretty crazy. Everyone at the aid station kind of gasped and cheered because I had fallen in full view of them, but it kind of helped me to get my downhill legs, we hit the station in 9:03 and pretty soon Kyle and I were cruising down the mountain in the rain just trying not to bowl anyone over. The trail was muddy and slick as snot from all the foot traffic and falling rain and we both nearly ate it multiple times on the way down, but people were great about giving us the right-of-way on the trail. The river crossing and puddles in the meadow felt great on my legs and I kept a solid pace while Kyle ran ahead to refill bottles and get more gels. The rain felt great, too. It seemed like it had been a hot race so far so it was nice to cool off some. 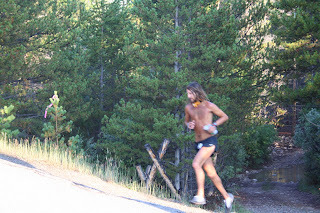 We got into Twin Lakes in 9:48 and everyone was telling me I had the fastest time to Twin Lakes ever, but I knew that simply wasn't true: in 2005 Matt had come through in 9:39. Kyle grabbed a jacket for the rain, but as soon as we started the climb out of town it had stopped raining and was sunny. We hiked most of the climb on the road up to the Colorado trail. There were some flat sections we ran, but it was mostly hiking. Once we got on the trail, though, I ran basically everything. Last year I had hiked almost all the way to the South Elbert trailhead, but this year I was much stronger. Kyle kept telling me to take it easy-we still had almost 40 miles to go-and I was very pleased to actually have an "easy" gear to access. Last year it took all my effort to keep moving at all at that point. The rest of the way over to Halfmoon was like that. We'd run everything but the steepest sections of the trail and when I was running I wasn't running nearly as fast as I could've been going-I deliberately took it easy. On the final downhill to the road we cruised and Kyle refilled our water bottles at the stream crossings.I was getting a lot of unpurified water in this race, but I hadn't been purifying my water all summer, so I was fine with it. We got to the Halfmoon aid station in 11:24 and then continued on down the road to Halfmoon. I felt good on this section and we ran a very solid pace through here, getting to Treeline in 11:46. It was hot and sunny when we got out of the trees, plus I just hate running on that asphalt road. As a result we slowed pretty significantly on this 4 mile or so section, but I still felt a lot better than last year. We got to Fish Hatchery in 12:23:30 and it was a nice surprise to see my parents there who had driven 12 hours out from Nebraska that day--this would be their first time seeing me at an ultra. Kyle and I kept a solid pace on the road over to the bottom of Powerline and then began the long climb to the top of Sugarloaf. This is where I completely died last year, so I was curious to see what would happen this time around. We ended up hiking the steeper stuff and running all of the less steep inclines and of course the flats and downhills to get to the top of the climb in 1:01 from Fish Hatchery (I call the little road coming in from the top of the mountain the "top" of Sugarloaf). When we got to the top we started running for good, and fast. I was really happy with the way I was able to keep it going down this hill whereas last year I had to walk most of it because I was destroyed. On the Hagerman Pass road mile over to the Colorado Trail Kyle and I clocked a 7:40 and we had definitely slowed down from what we were doing on the upper stretches of Sugarloaf, so we were moving pretty good. Once on the Colorado Trail things were even better because now my legs could benefit from the varied nature of the trail (as opposed to a flat, even road). All through here Kyle kept telling me to slow down and take it easy, but I was feeling great (as great as one can feel after running 80 plus miles, I suppose) so we kept cruising into Mayqueen in 14:11. My split there kind of surprised me-I hadn't expected to get there that fast-and I definitely started thinking about trying to run sub-2hrs for the last stretch and get under 16:10. However, I ended up playing it on the safe, somewhat complacent side and Kyle and I basically just ran under control all the way around the lake, up the Boulevard, and into the finish. It took us 48 minutes to get over to Tabor boat ramp (14:59), and then I split a laggardly 1:15 up to the finish (last year I think I ran that last bit in 1:10). It's very easy to tell yourself at that point in the 100 miler (especially when you're leading by so much and you're going to run a pretty fast time anyways) that you don't care about the extra 5 minutes or so that you could cleave from your time with a little extra effort and that you'd rather just run it in comfortably instead of risk pushing too hard and blowing up-but, somewhat unfortunately, that's what I did. I was definitely tired and grunting and groaning with basically every step the last hour or so, but I was also definitely not going as hard as I could've or maybe should have. I definitely remember not taking the downhill off the lake as hard as I could've and then basically just going into "get it done" mode the last 45 minutes or so into town. Overall time at the bottom of the Boulevard was 15:41 and Kyle and I hiked up the rocky little hill at the bottom while I took one last gel just to make sure I made it. Again, I was definitely tired at that point, but really I think complacency and a lack of urgency made me not run as hard as I could. Either way, I was very pleased with the race overall and really enjoyed the run through town into the finish in 16:14:35 (for a 8:31 second half)-especially finishing in the daylight. Kyle and I never even took headlamps at the boat ramp. Afterwards I was pretty darn sore and tired, but there wasn't any extreme soreness in my IT bands like last year. The next morning after another nice night on the soccer field we all drove down to the lake and went for a run---I did 45 minutes without too much problem considering last year I had a really hard time even walking. I know that I can still run this race faster, so I'm sure I'll be back next year. Trained really, really hard in the 5 weeks of health that I had before it was time to taper. Emphasized LOTS of climbing and lots of altitude in my training. Stuck to my plan and slowed down on the road section on the way out. Didn't freak out when I got a sore throat the week before the race or a headache (and no sleep) the night before the race or when the headache didn't go away until Twin Lakes on the way out. Switched to water and salt caps to stay hydrated when I couldn't stomach the Powerade. Got injured back and May and stubbornly waited for it to heal itself when apparently all it needed was some manipulation from Dr. Leahy and Matthews over at Champion Health. Two months of training completely lost. Didn't switch to water soon enough in the race. I should've known I wouldn't want to drink that stuff. Didn't have a bright enough headlamp, but that may have been OK because it made me run nice and slow. However, whenever I take a serious shot at the course record, I need a bright light for the section over to Mayqueen. Didn't give it my all from the top of Sugarloaf into the finish. Who knows, maybe if I'd gone harder I would've blown up and ended up hiking in the last few miles, but in the future I'll definitely be interested in at least finding out and not having to deal with some minor shoulda/woulda/coulda's. I say minor, because really, I'm very happy with my race. Leadville's a great great race, but I'd love to see it take the lead in trail 100 milers and start offering some incentives for top runners to come in and keep pushing the limits there. I applaud Harry's second place finish and personal record for the course, but I REALLY shouldn't win this race by more than 3 hours. There are plenty of great ultramarathoners in this country, and with Leadville's history and tradition it could be an even more significant race on the circuit (deeper field, more media, etc. 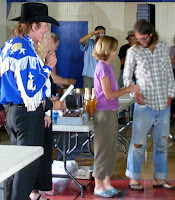 = more MONEY FOR LEADVILLE!!) if it would just offer some incentives for competition and maybe get some things on the technical side worked out -- like having a workable webcast and some very easy, simple YouTube video coverage. 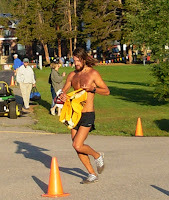 funny that you mentioned back in 2007 that Leadville should draw more attention! look at it now. pretty crazy. This post is really interesting, thanks a lot. I enjoy reading your experience, it's really great. Thanks for posting your story, I like reading it. It has already had incredible impact whack your boss 2 on our little family y10, and I am so looking forward to seeing zoxy the goals it helps us reach in years to come earn to die. We are certain that even if moto x3m we reach a point of "great wealth" or whatever, we will live on a budget. It's important to have discipline and boundaries in our lives. Play kizi games online. Search for your choicest of online Kizi games and go for enjoying a great free online gaming experience with kids. Play with millions of players around the world and try to become the longest of the day! Slitherio online is totally free. Motox3m2 is back now on it's second installment where you have to make stunts, win races and compete against other skillful opponents. Bloxorz games Block Puzzle Skill Games Free Online Skill Games. This is superb! I had no idea a document could look this good. Eat cells smaller than you and don't get eaten by the bigger ones, as an MMO. agario, agar io, agar, agarz, agarw gaming. Friv 1000, friv 100, Friv 10 and Friv 2 is a safe place to play the very best free Friv4 games! City of Friv2 & Friv10 Games and Juegos friv 100! Trong cac cach bo thai thi pha thai an toan luon la van de duoc chu y va dung nhieu nhat. Trong bo thai an toan lai co: pha thai bang thuoc, nao hut, nạo phá thai. Cac cach huy thai duoc dung trong nhung truong hop bat dac di, bat buoc phai huy bo thai neu thai phat trien di dang, thai mang benh, thai gay nguy hiem cho thai phu, thai ngoai y muon,... Ve mat nhan dao, khong nen pha thai. Vi vay, chung toi khuyen cac ban tre hay can than, tinh duc an toan con co the phong chong duoc bệnh xã hội, tich luy cho minh ve kien thuc gioi tinh de co the tu kiem soat ban than, tu kiem soat hanh vi, tranh de viec kho cuu van xay ra. Teuing eung, tunduh wae panon teh, kadang sok kalabasan keur nga backlinkan, nyampah dina blog ieu teh..